With many hands and many eyes, lavishly adorned and honored in countless temples and altars, the Hindu and Buddhist pantheon of Deities hold rich antiquity for the cultures who honor them. There are those names which we hear again and again, more often than many of the other Gods and Goddesses. Buddha, Tara, Quan Yin, Shri Lakshmi, Ganesha, Hanuman, Shiva, Saraswati, Krishna…. Who are these mysterious beings? Where do they come from and what are their teachings? In the ancient and modern religions of Asian Buddhism and Hinduism, there rise to the surface deities which, in their similarities, show us the nature of divine correspondences and how these religions utilize them in their daily lives. Some of these deities, despite having transformed over time, taking on different names and even genders, have remained constant, etching out their own deeply faceted personalities into our permanent Akashic records. The household Goddess of most Hindu families, Lakshmi is revered to bring good luck. It is no wonder she is favored, especially amongst women, as she is the female wife and energetic counterpart to Vishnu, therefore; a supreme being held in the highest regard. 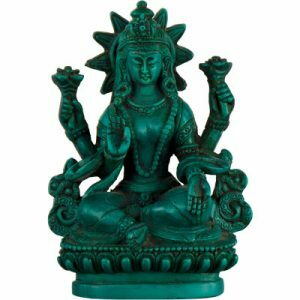 She is the Hindu goddess of wealth, fortune and prosperity and is worshiped daily, especially in the month of October, her ‘special’ month. Lakshmi is derived from the Sanskrit word “Laksya” meaning “aim” or “goal”and is the goddess of spiritual and physical prosperity. Dressed in gold and red, she is often seen on a bed of gold coins, with coins in her hand or coins nearby. In Buddhism, Lakshmi is also the goddess of fortune and abundance and is seen on some of the oldest surviving stupas and cave temples. Lakshmi‘s sacred name is Shri, spoken before addressing a God, a holy person or a teacher. Shri is a word used to define the holiest and most sacred and evokes characteristics of grace, affluence, abundance and authority. Tara has become one of the most popular female Asian deities, being called the “Mother of Liberation” in Tibetan Buddhism, as well as the “Goddess of Compassion” and “One Who Saves”. Also called the “One Who Protects“, she was born in the Hindu faith and being a female Bodhisattva, is one of the supreme beings. She helps us to develop inner qualities of compassion and emptiness. There are 22 different invocations of Tara to represent the different aspects of her personality. Two include colors: White Tara signifies purity, truth and innocence and Green Tara is a fierce protector who helps us overcome earthly obstacles and danger. In Sanskrit, Tara means “Star” and she is believed to be a star goddess, knowing of all time. She is said to have been born from the sea and has strikingly similar characteristics to Aphrodite. Tara teaches the virtues of success in work and our achievements. Tara will bring blessings of protection, innocence and truth and will teach us true compassion when we seek her assistance. With iconography that flourishes in metaphysical supply stores and is as old as dirt, it is hard not to recognize this vastly popular elephant headed deity. Ganesha, known commonly as “The Remover of Obstacles” is a vastly recognized and immensely important “figure head”, worshiped in Nepal, Thailand, Shri Lanka, India and most Asian regions. He is the God of beginnings and evoked to start rites of passages and ceremonies. He is the God of intellect and wisdom and the patron god of arts & sciences. He is the deity recognized when entering temples and statues of Ganesha are found in most towns in India. Ganesha is steeped with symbolic meaning with his unusually large ears, pot belly, one broken tusk and four or more arms holding items in each hand. The large ears are so the wise one can hear all. The broken tusk is because the wise person is beyond duality. As a god of letter writing and studying, there are depictions of Ganesha holding his broken tusk with his trunk in order to write letters. In his hands, the lotus represents enlightenment. The elephant goad, used to steer elephants, represents steering the soul away from ignorance and illusions of this earthly world. A “Pasam” or noose is a twine weapon used to drive away arrogance, conceit, and illusions. A pot of rice, a piece of meat or a sweet treat represents the rewards of a wise life. A hatchet represents the cutting away of old karma. Often, one of his hands holds a sign for the blessing of all people. An elephant’s trunk, which has the strength to uproot a tree or dexterity to pick up a needle, symbolically represents both immense strength and fine discrimination. Quan Yin, also spelled Kwan Yin and Kuan Yin, translated into Chinese, the name is “Kuan Shih Yin”, Guanshiyin, or Guanyin, originally a male deity, “who looks upon the world with compassion.” He vowed to rescue those who were suffering. This male deity was later transformed into a female version as Quan Yin and most of this Bodhisattva’s images are represented as female since the Tang Dynasty (A.D. 618 – 907). When formed from Guanshiyin into Quan Yin, the new female form was given a thousand arms to reach out and stop suffering in the world and an eye in each palm to see anyone in need. Quan Yin in Sanskrit means “she who hears the cries of the people”. The Goddess of Compassion, Quan Yin may hold in her hand a willow branch, to heal illness, a vase of water to cleanse and nourish the spirit or a lotus flower to bring enlightenment. She is revered as a merciful goddess, bringing healing and restoration, especially to children, fishermen and those who would sacrifice themselves to help others. Quan Yin invokes feelings of compassion and unconditional love and is said to be the mother of deceased children. Vishnu – Principal deity of Hinduism and supreme being. Vishnu is the preserver and protector of humanity. Quan Yin – Mother of Compassion, protector of children, fishermen, firemen. Healing. Quan Yin is the embodiment of mother and assists those who are suffering. Saraswati – Hindu goddess of arts, music, nature, knowledge and wisdom. She leads to the essence of self knowledge. Krishna – God of Compassion, tenderness and love. An aspect of Vishnu and a supreme God. Lakshmi – Goddess of wealth, fortune and prosperity. Female counterpart of Vishnu and supreme being. Hanuman – Monkey demigod in the epic Ramayana, devotee of lord Rama. He exemplifies supreme devotion. Tara – Goddess of liberation, protection and purity. Savior goddess who brings compassion and truth. Ganesha – Remover of obstacles, God of beginnings, arts and sciences. Removes arrogance and conceit to bring enlightenment and wisdom. Shiva – Third God in the Hindu triad or “great trinity”, consisting of three gods responsible for creation, upkeep and destruction of the world. Shiva is the “destroyer” or “transformer”, harbinger of change in both death and destruction and in the form of destroying the ego. Amoghasiddhi – Almighty conqueror, wisdom of perfected action. He is the realization of the Buddhist path and destroys the poison of envy and jealousy.